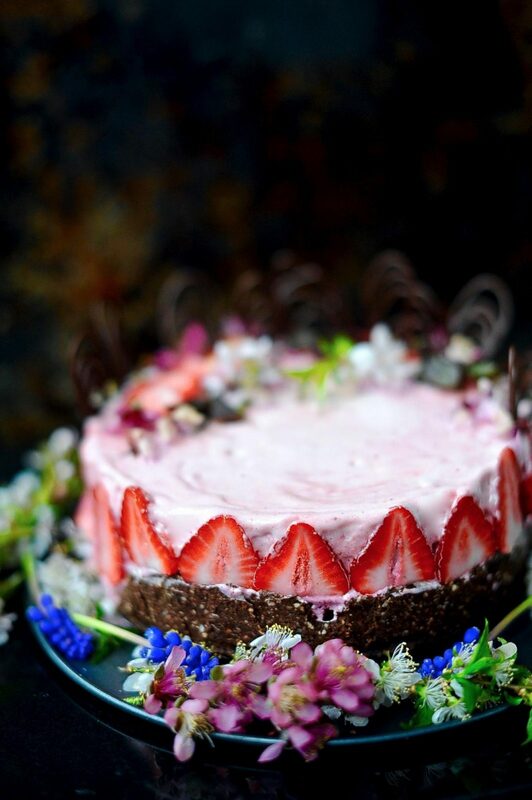 This berry ice-cream cake captures the ephemeral juicy berries of spring and transforms them into the creamiest ice-cream I have ever tasted. 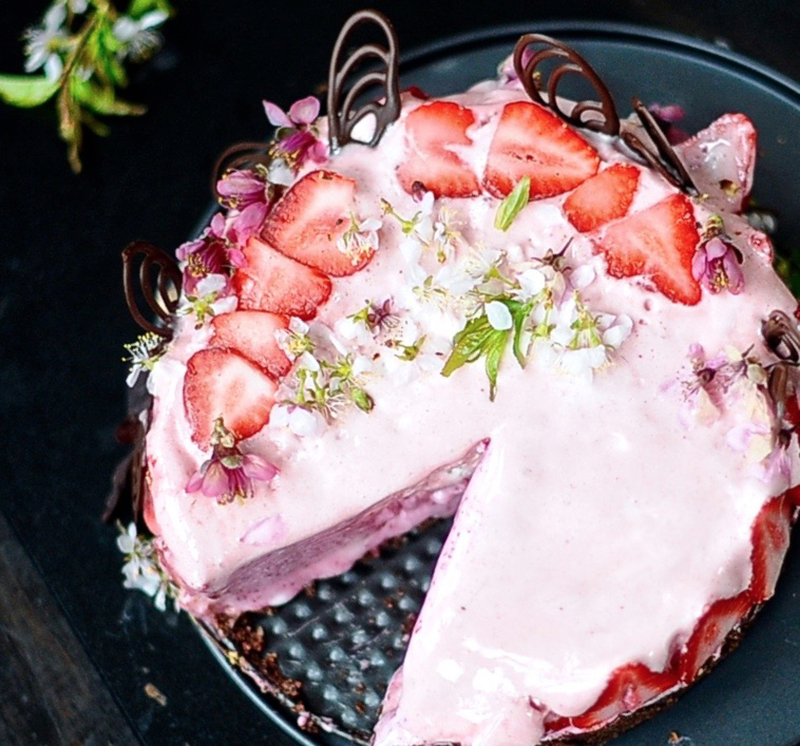 You can just make the ice-cream and enjoy every last silky, creamy, airy bite or you can go the extra step and impress those you love with the perfect berry-licious ice-cream cake. Stepping from the bright sunlight of a Providence afternoon into the dim interior of my Bulgarian neighbor’s house I exhaled the troubles of my teenage life and inhaled the old world. Slipping the key into my jean pocket I made my way to the kitchen past the dark wooden harpsichord and the bowls arranged with ornately painted wooden eggs. I rummaged in the fridge, arranged a tray with buttered toast and placed small ripe berries in the prettiest bowl I could find. Making my way up the narrow stairs to where Debussey spilled like dark cherry juice from the radio I called out to let Mamushka know I had arrived. She sat up in bed, blooming like a sweet-pea vine in powdery profusion, wrinkled and pale from head to toe. They were all a little sleepy, soaked in sunshine and breathing the fruity smell of berries. I set the tray softly on the side table and clambered onto the bed careful not to sit my round frame on her stick thin legs that barely made an impression beneath the coverlet. She held a pack of well worn playing cards in her impossibly long fingered hands and shuffled with a smooth proficiency that would have made a dealer in Las Vegas green with envy. Mamushka knew 1001 different games of solitaire. We spoke little and I learned the rules of each game from watching her moves, as I also learned to tat lace from her, wordlessly. When we lost a game she would reach out to comfort me and gently cup my round cheek to forestall any disappointment on my part. On those rare occasions that we won a game, she would give my hand an excited double pat, scoop the cards up and deal out a new and different game. She was so hasty in the re-dealing of the next game that I understood the luck of the winning game need be quickly shuffled into the deck before it faded, as luck does. I’m thinking of Mamushka as I quickly grab the treasured berries of spring and shuffle them into my life before their potency fades. She praises her strawberries too highly. -Atanaska Todorova, A.K.A. Mamushka. 1893-1986. This 6 inch cake packs a wallop of intense berry flavors. It is my little ode to the ephemeral nature of spring. No worries if you are lacking fresh berries, frozen work wonderfully as well. I used an 8 inch spring form pan. Press your dough along the bottom and a bit up the sides of your spring form pan. Press it well and good until you have a thin layer coating the bottom of your pan and rising up the sides as far as you want esthetically. Place the springform pan with the crust in the freezer to chill while you make the fillings. In a food processor blend 1/2 cup of the cashews, 1/2 tbsp of the coconut oil, 1 tbsp of the lemon juice, a small pinch of salt, 1/4 banana and 1 cup room temperature blackberries (plus any juice that leached out from defrosting) until smooth. Now strain the mixture if you don't want the tiny seeds from the blackberries. I leave mine in. 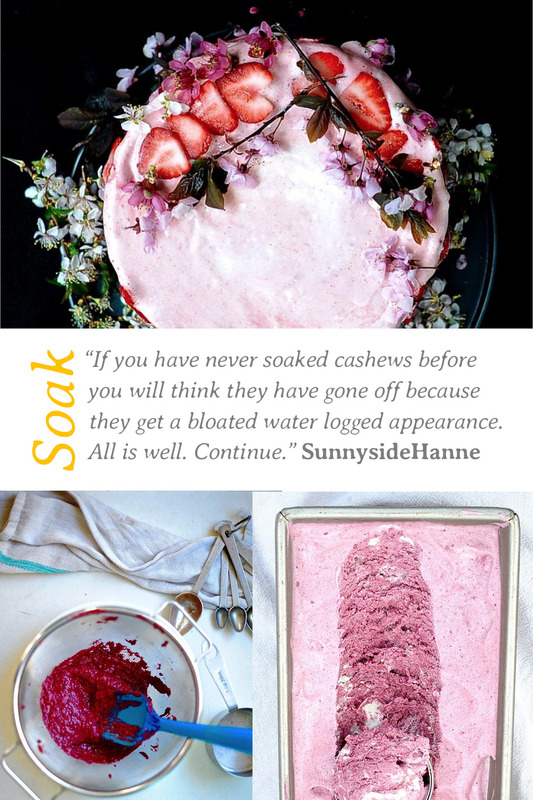 Rinse and dry your blender and add 1/2 cup of the cashews, 1/2 tbsp of the coconut oil, 1 tbsp of the lemon juice, a small pinch of salt, 1/4 banana and 1 cup room temperature strawberries with any juice that leached out while defrosting until smooth. Now strain out the seeds if you prefer ice-cream with out seeds. Pour in your cooled aquafaba (that has been reduced on the stove to the consistency of egg whites) and cream of tartar into the bowl of a stand mixer fitted with a balloon whisk attachment and whip on high until stiff peaks form. This will take anywhere from 5 -10 minutes. Add the liquor or vanilla extract, if you prefer, and whip another minute. Slowly add the sugar 1 tbsp at a time to the whipping bowl. Whip at least 30 seconds between additions. Scoop enough of the blackberry/aquafaba mixture into the chilled pan to fill half way and gently smooth the top. Now scoop the strawberry/aquafaba layer on top and fill the pan the rest of the way. 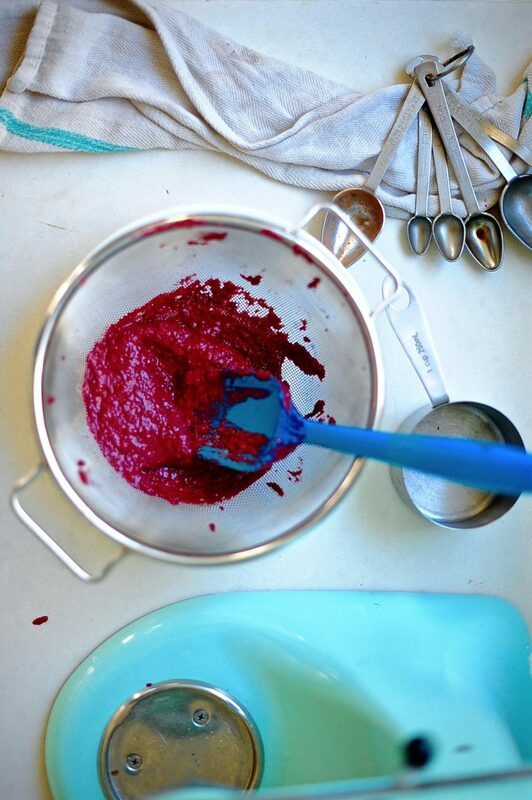 If you have extra berry aquafaba mixture then place it in a covered container and freeze until firm and you will have a little extra ice-cream for sneaking. Cover the top of your cake pan with aluminum foil to avoid freezer burn. Place your ice-cream cake in the freezer at least 12 hours. When the cake is ready, unmold it (un-springform it) and place it back in the freezer. I personally don't remove the bottom round of the pan from the cake. Call it a lack of bravery on my part but that is how I roll. Now slice your strawberries super thin. Take your cake out of the freezer and gently press the slices of strawberry around the edge of the cake in a pleasing design. Johannesburg, you have an amazing website, so rich and inspirational. 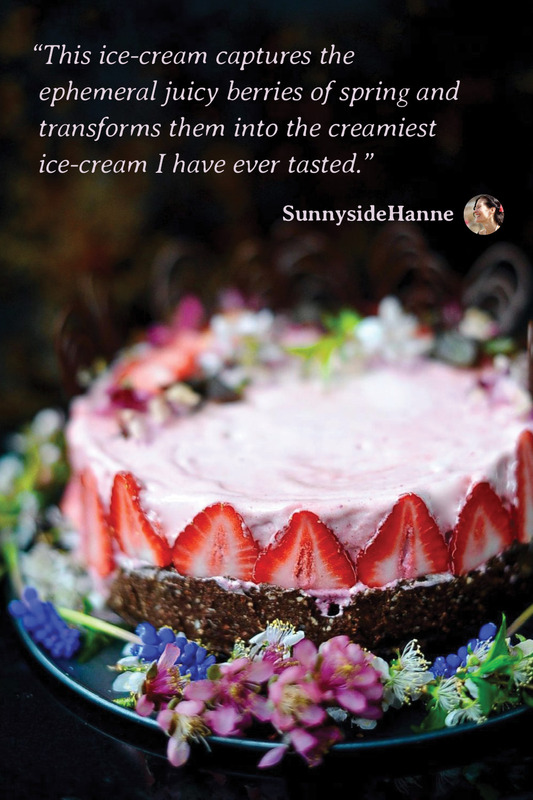 Thank you for sharing beauty, creativity and delicious flavourful recipes. Oh wow, thank you. The sun came out with your words. Yes! 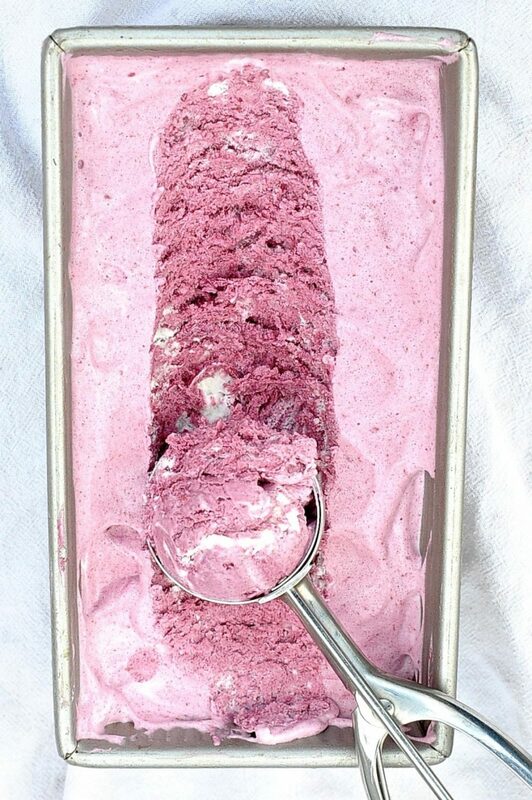 I def want to make the berry ice cream! Congrats on another beautiful post. Oh you are so kind. I hope you enjoy every bite! Oh, Mamushka! 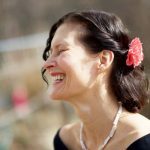 As our mother plied her with glasses of vinegar-laced water – Mamushka said it was the only thing that might slake the seering thirst that plagued her toward the end – I imagined her remembering the springtimes of her Bulgarian girlhood, surely filled with blossoms and berries like we’ve never seen. That would have been a hundred years ago and the war that ripped everything apart was still far in the future. It still wrenches my heart to think that her beloved daughter died before her, and I still keep the daughter’s simple silver band warm on the ring finger of my left hand. 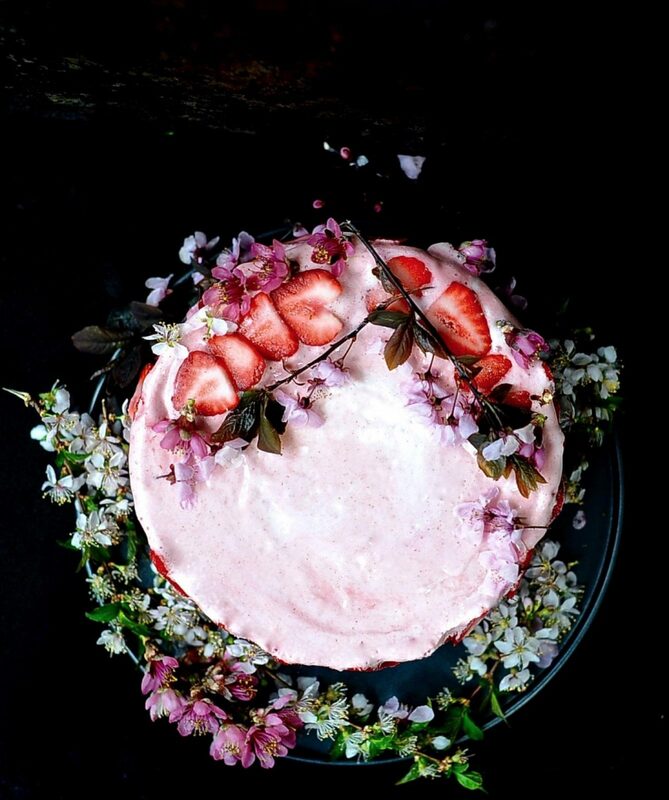 Your cake looks like something a fairy should wear on her head. I’ll try to find cream of tartar so I can make it. Oh Mamushka is right. They traveled across land masses and through wars together. Ach. The stories and changes that she witnessed that died with her. I wish I had a photo of her when she and Adelka were young. Thank you. Ah: Adelka’s Bulgarian Mamushka … how well I remember her and those berry-sweet days in Providence before it was chic … though we all were beyond imagination. Providence didn’t have a cool bone in it’s body in those halcyon days. Is there an alternative to the aquafaba? I am doing a food sensitivy eliminaton diet and have not added beans back in yet. But this recipe looks amazing. 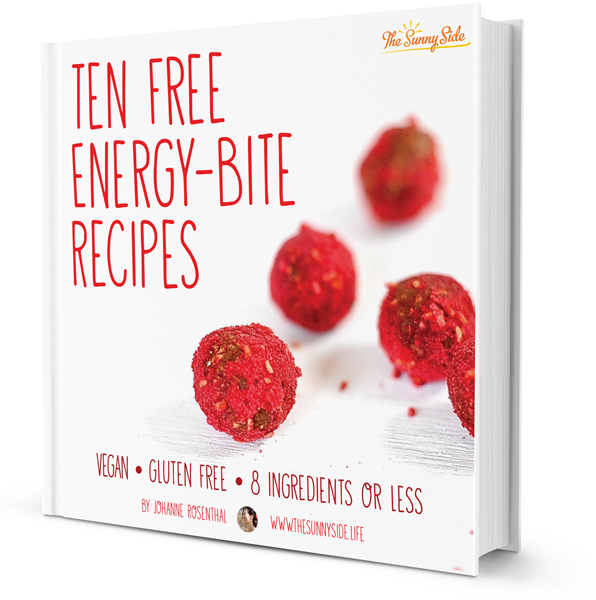 Im a huge fan of raw desserts! Whipped coconut cream might work in this recipe. 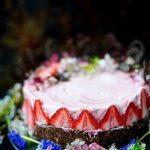 If you look at my Raw Raspberry Rose Cheesecake in the files you’ll find an intensely flavored and delicious alternative frozen cake. I hope this helps. I hope you figured out any foods you are sensitive to. I just made this cake for my birthday and it was by far, the best gluten free birthday cake I have ever made!! Seriously could not be more excited about it- even my gluten eating family was impressed. My uncle, who says he doesn t even like chocolate cake, went back for seconds! I used the chocolate icing from the one bowl vegan chocolate cake and love them together. Thank you for this amazing recipe!!! Audrey, Happy Birthday to you!!! This cake is berry, berry good. See what I did there? But anyway, yeah, trust me. This cake is much better than that pun. Very Matt Seavy. Lol. Not as bad as Papu’s puns.